Pumpkin Pecan Pie? Or Spritz Butter Cookies? The baking schedule got a bit turned around this weekend. Marie had intended to have the pumpkin pecan pie on the schedule at the right time for Thanksgiving dinner. She posted to our Facebook group recently to apologize – because for Americans, having the pie made in time to post about it on the Monday before Thanksgiving Thursday would mean that it would have to sit all week waiting for the big event. I have to admit, I’ve never really understood why Thanksgiving’s on a Thursday in the US, but that’s beside the point. Anyway, at the last minute (after I’d baked it), the schedule got updated to swap pumpkin pecan pie with spritz butter cookies. I did not make spritz butter cookies. Since I’m married to an American, we often do two Thanksgiving dinners. One for the real thing in October, and one for this silly American thing at the end of November. Since we don’t get Thursday off, we did it the weekend before, this time. Perfect timing for pumpkin pecan pie! I don’t think I have much to say about this one, really. I didn’t take many pictures, either. Add the sweet goo that is pecan pie filling (sugar, egg, butter, golden syrup…), and bake for round 1. Make the pumpkin filling. I got no pictures of this, but it’s basically cook pumpkin with sugar and spices, then whiz that in the food processor, then add eggs, cream, and milk. Really, the whole thing is about all things that are delicious. After the pecan pie layer has cooled a bit, add the pumpkin filling, and bake again, only this time with a pie shield to protect the crust. Next stop: Thanksgiving dinner. We had apple pie, pumpkin pecan pie, cornbread, and rolls. Er.. and the stuff Jay made, too. Turkey, gravy, mashed potatoes, maple glazed carrots, green beans and salad. Actually, you know, despite not being much of a cook, I contributed to much of that, too – all but the turkey, gravy, salad, and converting the cornbread into stuffing. Jay prepped the veggies and cooked the potatoes, but I did the seasoning and mashing and whatnot. I’d call dinner a success. Nobody went away hungry, but plates were clean, and we had turkey soup for dinner the next day. We also now have a freezer full of poultry stock, since we tend to save up chicken carcasses until we do a turkey, then boil all the bones at once in the pressure cooker. Despite both of us trying both types of pie, neither Matt nor I had trouble cleaning our dessert plates. Jay’s even had some pie in the last couple of days since then, so I must have done something right. He’s not generally a leftovers person. Inspired by my recent trip to (…Swabia? Bavaria? Technically, modernly,) Baden-Württemberg, I made a crème anglaise (aka vanilla sauce) to go with the apple pie. Feedback on that, so far: a little bit thicker and a little bit more vanilla, next time. Next time is tomorrow night, for my contribution to a potluck “soup strainer” Movember lunch at work on Wednesday. No auction this year, though, so I’ll have to find other ways to get the baking out of the house over the coming year! 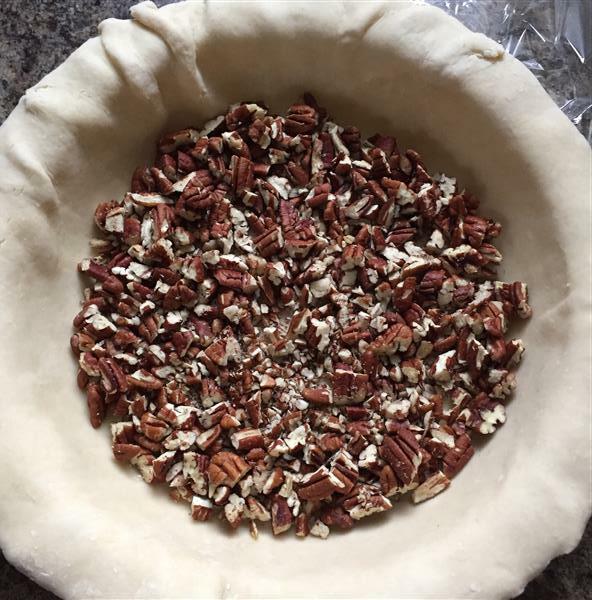 Posted on November 24, 2015 by KristinaPosted in The Baking BibleTagged pecan, pie, pumpkin. I have no idea why Thanksgiving is on a Thursday, either, but we loved getting out of school for two extra days growing up! Your dinner sounds like it was delicious. Love the idea of a custard sauce over apple pie. My mom talked about custard sauce over apple dumplings they had as kids sitting at the counter at Woolworths. I think I’ve had apfelstrudel mit vanillesoße 3 times now. And I’ve been to Stuttgart area 3 times, too. Coincidence? No. I can certainly see the appeal. The apple pie (I’ve been making the luscious apple pie, but with struesel instead of a top crust) was a hit today at lunch, and I hear everyone was talking about the vanilla sauce, too. Note for future reference: pastry scraps turned into mini cinnamon rolls, dipped in vanilla sauce, make a fantastic mid-morning snack. I too wonder why Thanksgiving on Thursday? Is it because all of you get long weekend holidays? Like eat dinner on Thursday and then Friday is holiday..? Wow..you made 3 desserts? That’s what people seem to do in the US. Here in Canada, the Thanksgiving holiday is a Monday. Weird Americans.